West Introduces LyoSeal® Instant Sealing Solution and NovaGuard® SA Pro Safety System at Pharmapack Europe | West Pharmaceutical Services, Inc.
EXTON, Pa., Feb. 1, 2017 /PRNewswire/ -- Booth #H26 -- West Pharmaceutical Services, Inc. (NYSE: WST), a global leader in innovative solutions for injectable drug administration, today introduced two new offerings at Pharmapack Europe 2017. The LyoSeal® cap, an all-plastic, instant sealing solution for lyophilized drug products, is designed to minimize risk associated with established lyophilization processes, while maintaining the necessary sealing requirements. The NovaGuard® SA Pro safety system, which is pending 510(k) clearance in the United States, aids in the protection of healthcare professionals, patients who self-inject doctor-prescribed medications, and individuals who assist self-injecting patients, from accidental needlesticks. These innovations, along with West's high-value product portfolio and leading scientific insight, will be showcased at the West Pharmapack booth, February 1-2, 2017, in Paris, France. "We appreciate and understand that in today's healthcare environment, our customers are continually looking for new packaging solutions that offer manufacturing efficiencies, as well as products that provide an improved experience for healthcare providers," said Karen Flynn, Senior Vice President & Chief Commercial Officer, West Pharmaceutical Services, Inc. "As part of our ongoing commitment to our customers and their patients, we're pleased to introduce LyoSeal and NovaGuard SA Pro—two products that directly respond to market needs. We look forward to showcasing these offerings—along with West's breadth of scientific and regulatory expertise—to attendees at Pharmapack." Reducing the risk of glass breakage within the lyo chamber due to the spring force design. West's NovaGuard SA Pro safety system helps protect healthcare workers and patients from accidental needlestick injury. The NovaGuard SA Pro system can be deployed using a single-handed technique and was designed to prevent pre-activation during handling. The system is compatible with ISO 1mL long glass staked-needle syringes and is transparent for ease of drug inspection and delivery. Furthermore, the device design facilitates easy assembly of a glass pre-filled syringe with very minimal change parts and changeover time to existing assembly equipment. Solving Complex Needs during Development of a Sensitive Next Generation Drug Product – Tibor Hlobik, Sr. Director of Product Management, Prefilled Systems & Delivery at West, will host this learning lab and present a case study on the approval process for a polymer prefilled syringe and how fill-finish capability was established for clinical and commercial supply. February 1 at 10:10 a.m. The Changing Regulatory Environment Concerning Elemental Impurities and Container Closure Systems – Fran DeGrazio, Vice President of Scientific Affairs & Technical Services at West, will provide an overview of the ICH Q3D guideline, its implication on related USP chapters and an overview of method development work completed to provide guidance to a new USP elemental impurities method. February 1 at 11:00 a.m. Emergence of Plastic Caps – Market Drivers and Key Considerations for Assessment – Miriam Beyer, Global Marketing Manager, Vial Containment & Delivery at West, will host this learning lab on assessing the external environment and internal challenges towards a change in sealing. February 2 at 10:50 a.m.
For more information on West products and services, please visit booth #H26 at Pharmapack Europe or visit us online at www.westpharma.com. Certain forward-looking statements are included in this release. These statements reflect management's current expectations regarding future events and operating performance and speak only as of the date of this release. There is no certainty that West's LyoSeal cap or NovaGuard SA Pro system will achieve any level of commercial success. These forward-looking statements involve a number of risks and uncertainties. For a description of certain additional factors that could cause West's future results to differ from those expressed in any such forward-looking statements, see Item 1A, entitled "Risk Factors," in West's Annual Report on Form 10-K for the year ended December 31, 2015. Except as required by law or regulation, we undertake no obligation to publicly update any forward-looking statements, whether as a result of new information, future events, or otherwise. 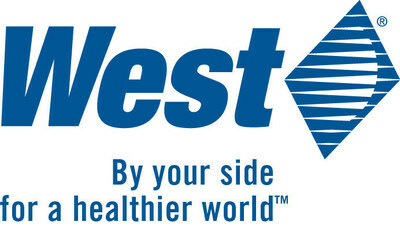 West and the diamond logo and NovaGuard® SA Pro are registered trademarks of West Pharmaceutical Services, Inc., in the United States and other jurisdictions. LyoSeal® is a registered trademark of West Pharmaceutical Services Deutschland GmBH & Co KG, a subsidiary of West Pharmaceutical Services, Inc., in the United States and other jurisdictions. Global Communications, West Pharmaceutical Services, Inc.